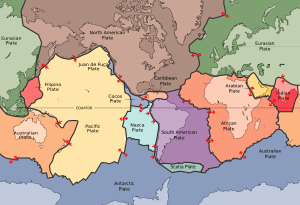 In geology, a rift is caused by tectonic plates in the Earth's lithosphere moving apart. Rifts are usually accompanied by orogeny (mountain building), volcanoes and earthquakes. The Great Rift Valley in East Africa is an example. The internal dynamics of a rift system. A rift is the result of the pulling apart or extension of the crust and lithosphere. Mantle upwelling brings hotter asthenosphere up into the colder lithosphere. This rise occurs with the thinning and stretching of the lithosphere. Rift (geology) Facts for Kids. Kiddle Encyclopedia.